What’s the Project? 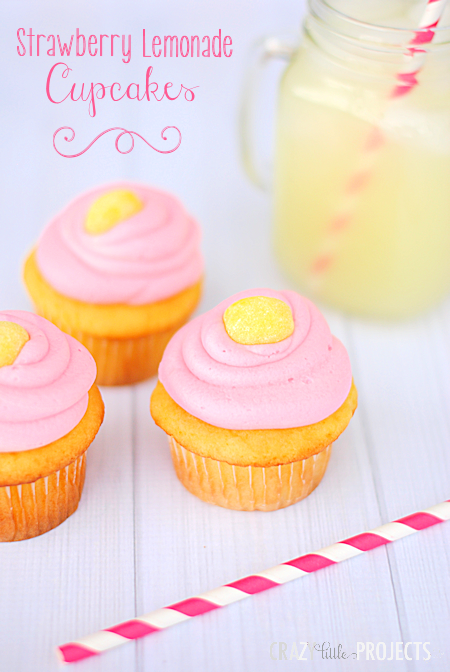 These strawberry lemonade cupcakes are the perfect treat for Spring or Summer! A sweet lemon cupcake topped with strawberry buttercream frosting. Add a lemon drop to the top to make it so cute! Last week my friend and I made about 350 mini cupcakes to spoil the teachers at our school for teacher appreciation week. 350 cupcakes! That was crazy, but fun! Most of our cupcakes were chocolately, but we wanted to offer a fun and fruity option too, so we created these Strawberry Lemonade Cupcakes. 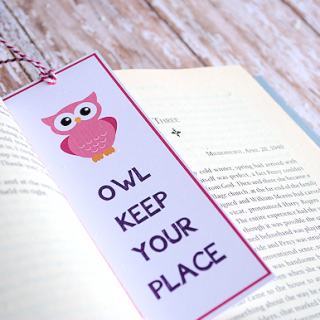 They are perfect for summertime and they are easy to make! And they were a hit. Plus they look so cute. They are made from a lemon cake mix that’s doctored up a little bit and topped with strawberry frosting and a lemon drop. They look so cute when they are done too! 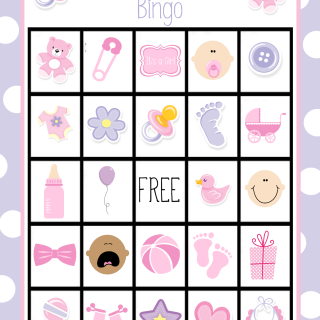 They are perfect to take with you to a summer gathering or to celebrate a summer birthday for someone. 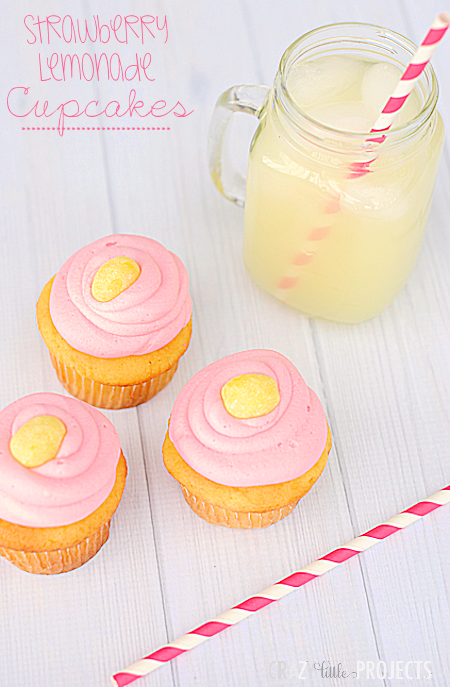 These strawberry lemonade cupcakes are the perfect treat for Spring or Summer! 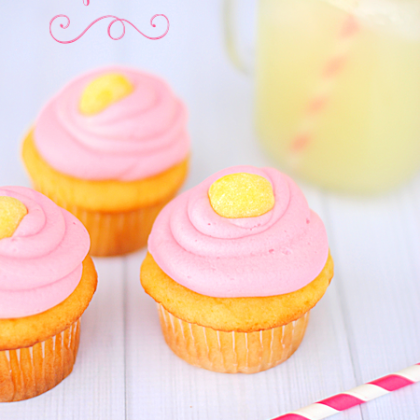 A sweet lemon cupcake topped with strawberry buttercream frosting. Add a lemon drop to the top to make it so cute! Combine all ingredients. Fill cupcake tins lined with cupcake papers about 2/3 full. The batter will be very thick. Combine all ingredients and mix until smooth. Add more powdered sugar as needed to achieve desired thickness. Put frosting in a large Ziploc bag. Snip off one corner and use it to pipe frosting onto cupcake in a spiral. Top with a lemon drop. Oh, these are adorable (and they look delicious)! 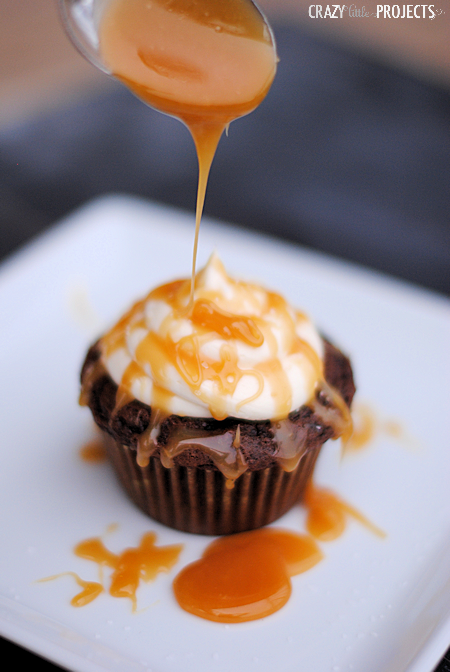 How did you layer the icing on the top so perfectly? My icing never comes out that way. Yummy!! 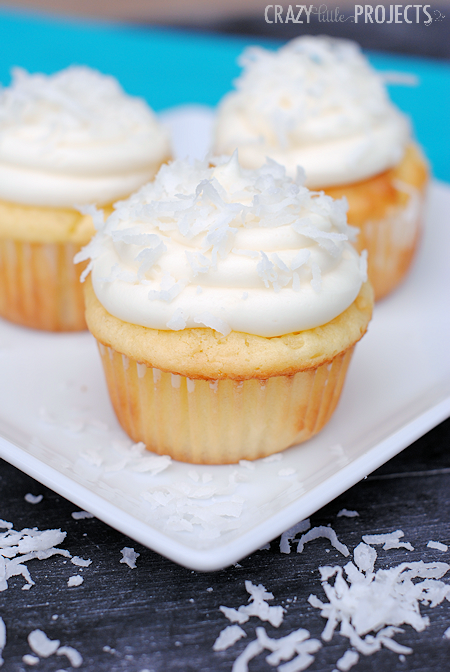 I have a lemonade cake recipe that I love, but my family are really into cupcakes so this is a perfect recipe. Thanks so much for the recipe!! Perfect for summer time.